Just a quick post to show a recent build: a DIY microphone stand. 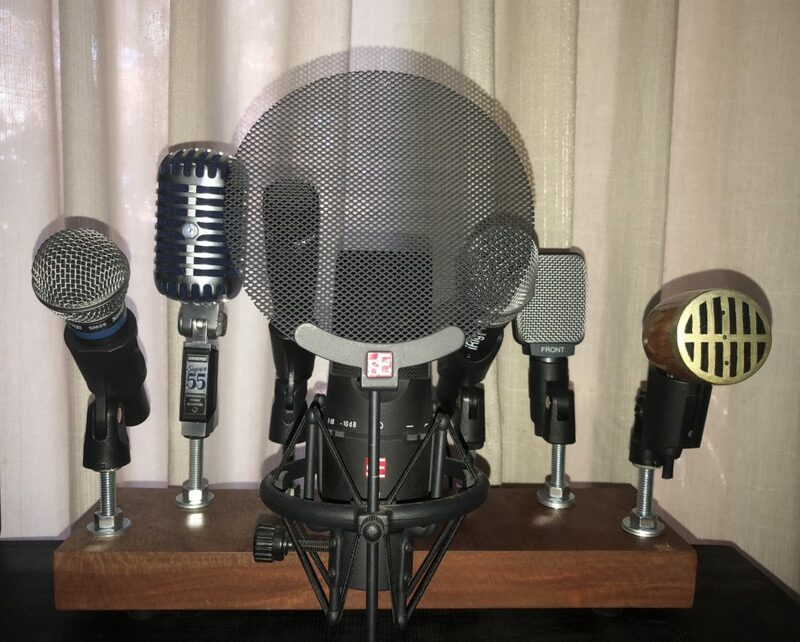 I wanted to keep the various mics I have close at hand when recording, but rather than tuck them away I figured they needed a public place – simply because mics look cool! I had an old piece of hardwood that I drilled to accept some bolts the same diameter as a standard mic mount. I also had to recess the back to allow the heads of the bolts to sit flush. Then it was as simple as a nut and some washers on each one (the washers allowed the bolts to bite on thread, as most long bolts have thread only running a certain distance up the shaft). Finally mount a few mic clips and good to go! A simple job that was very cheap and easy – and makes a nice piece in the music room!